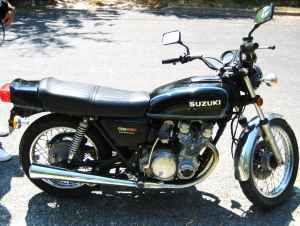 The 1977 Suzuki GS550 for sale is a bike that I bought it to make a hard tail bobber. I have started it in that direction, but the motorcycle's frame has not been cut yet and now it is time to let this project go and move on. It is in in ride-able condition and the tires are in good shape. The tank is reasonably new with NO rust inside but it does have a few small dents. It has Pro taper fatbars and the carbs were rebuilt with a full o-ring kit just last month. I have a clean and clear TN title in hand for the GS550. Those of you that have experience with this bike can use the comments form below this ad to write a review or voice any opinions that you may have formed from your personal experiences with a motorcycle similar to the vintage motorcycle for sale listing any problems with its performance, where to find used Suzuki motorcycle parts to restore an old bike like this one or anything of interest that you feel potential buyers should know.. Thanks for visiting GoGoCycles Used Motorcycles for Sale and for your interest in the 1977 Suzuki GS550. The location of the project motorcycle for sale is mt pleasant TN near Nashville TN Tennessee and in my opinion my asking price for this setup is cheap enough that it will be difficult to beat on Craigslist or on Ebay; just $1200 and as good as that is; the price is negotiable but I am not looking for trades but may consider what you have...bring what you've got and let's see. If you want to take a look at the GS550 or have questions, EMAIL for more details or to request pictures of the bike and don't forget to mention that you found this ad on GoGoCycles Used Motorcycles and Parts for Sale www.gogocycles.com when you contact me! I had one of these bikes back in the 1980s and sold it to my uncle. Then, he sold it to a kid going to technical college while I was there. The bike had just bellow 40,000 miles at that point. If you keep clean oil in the GS 550's, those early Suzuki 4 strokes will last a very long time. I loved that bike so much I bought a late model GS650 to replace it before I sold it. How's the paint and chrome? Where in TX?